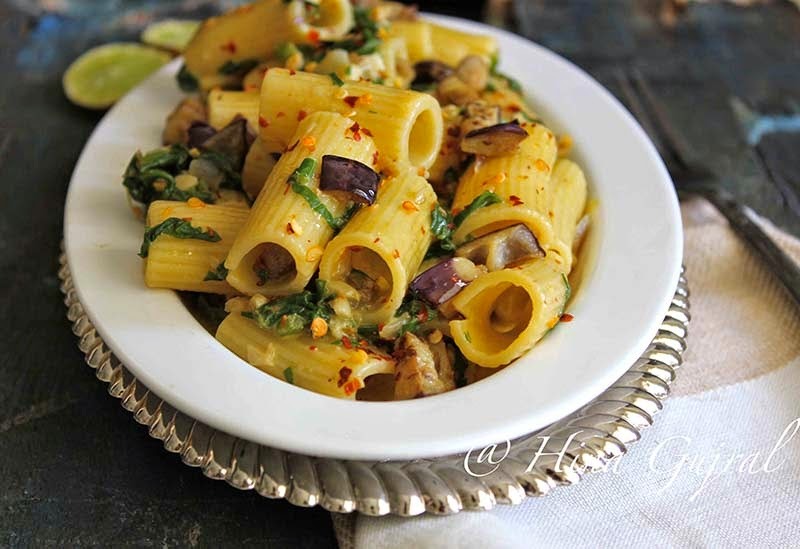 Spinach and Eggplant Rigatoni is one of the simplest pasta recipes and yet so full of flavors though the original recipe had spicy sausages, to give the recipe a pure vegetarian twist I added chili flakes, eggplant, and spinach. 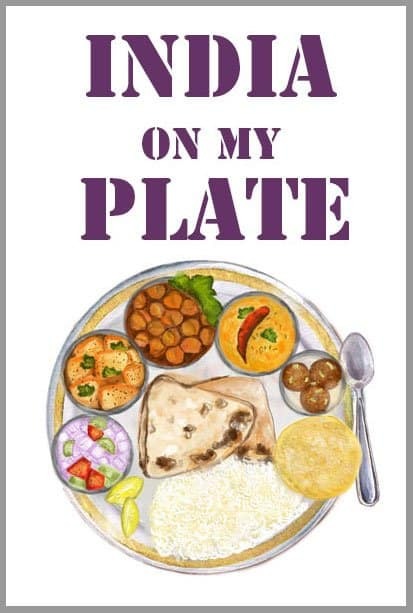 And I never thought earlier that eggplant can taste so good in pasta though with spinach I have experimented before also in Spinach Corn Pasta, instead of spinach kale, bok choi or any other leafy green can also be used. 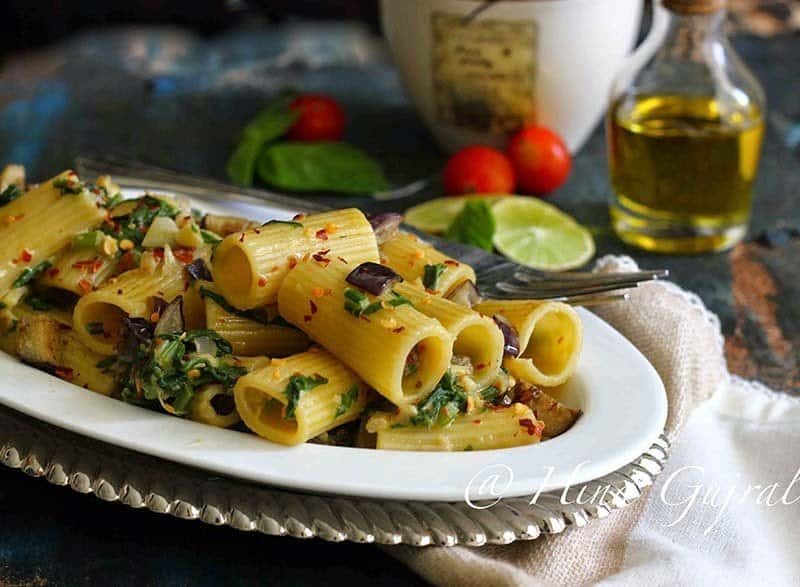 Pasta is my daytime comfort meal usually and I must confess one of my favorite repast as well, during afternoon when I have house to myself I prepare one pot pasta meal; relish it with a glass of wine and some good jazz music. 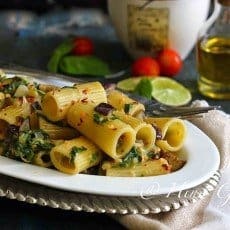 There is always something comforting about pasta dishes and it is always fun to experiment with numerous permutation combination of pasta and sauces. But with pasta I have noticed one thing quality of ingredients really matters a lot, whether it is dried pasta, olive oil or fresh cheese, all together helps build flavors in the dish. Over the years I have learnt one more thing that “He” likes his pasta over cooked and I like it al dente, so I usually prepare two batches of pasta one really soft and tender while the other one firm and just to the bite. One more difference of opinion we have about pasta, he loves pasta with robust sauce while for me light sauces with mild flavors always works well despite so many contrast thoughts our love for pasta is homogenous and we have no second thoughts about it. 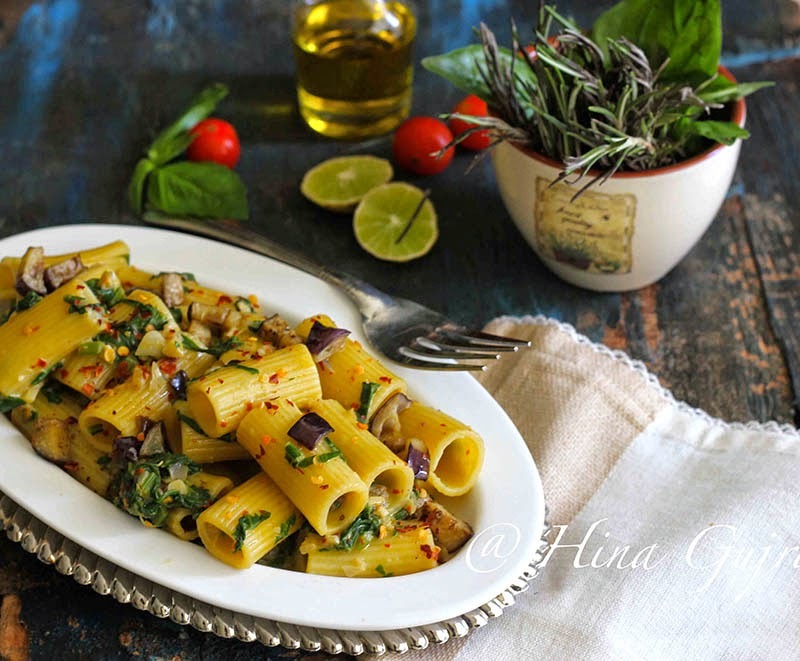 Spinach and Eggplant Rigatoni with Lemon Cream Sauce is a delicious pasta dish cooked in flavorful lemon sauce. 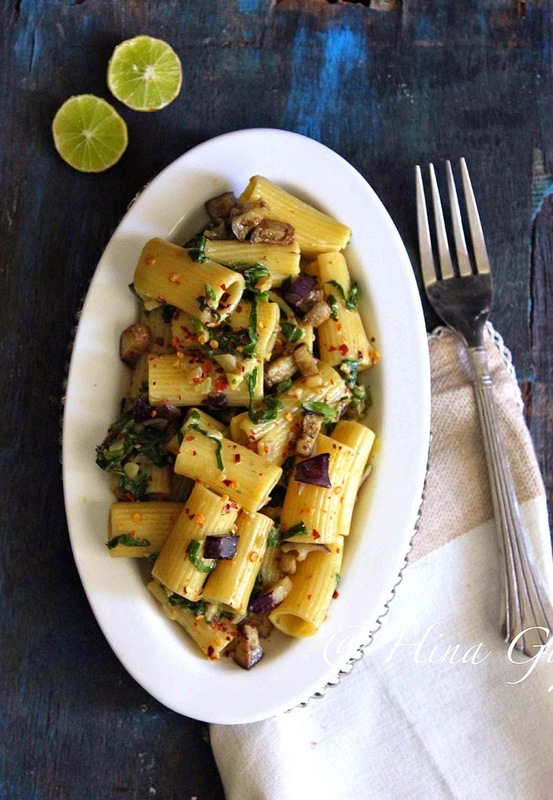 In a pan 2 tbsp olive oil over medium-high heat and add eggplant cubes. Saute until eggplant is cooked and tender but not mushy, during the process keep on stirring the pan frequently for even cooking. Heat oil in a saucepan over medium-high heat. Add garlic, onion and saute for 2 – 3 minutes or until translucent but not brown. Add red chili flakes; cook, stirring occasionally, about 5 minutes. Add chopped spinach, season with salt and pepper, and cook until wilted, about 3 minutes. Add cream and bring to a simmer; cook, stirring occasionally until reduced by a third, 7 to 8 minutes. Season with salt and pepper; set aside and keep warm. Bring a large pot of salted water to a boil over high heat. Add pasta and cook, stirring occasionally until cooked as per your liking. I usually prefer tasting pasta to check for doneness. Drain in a colander, reserving ¼ cup cooking water; add both pasta and water to reserved sauce and cook about 5 minutes more or until sauce thickens. Fold in cooked eggplant and mix nicely. Switch off the flame. Drizzle lemon juice. 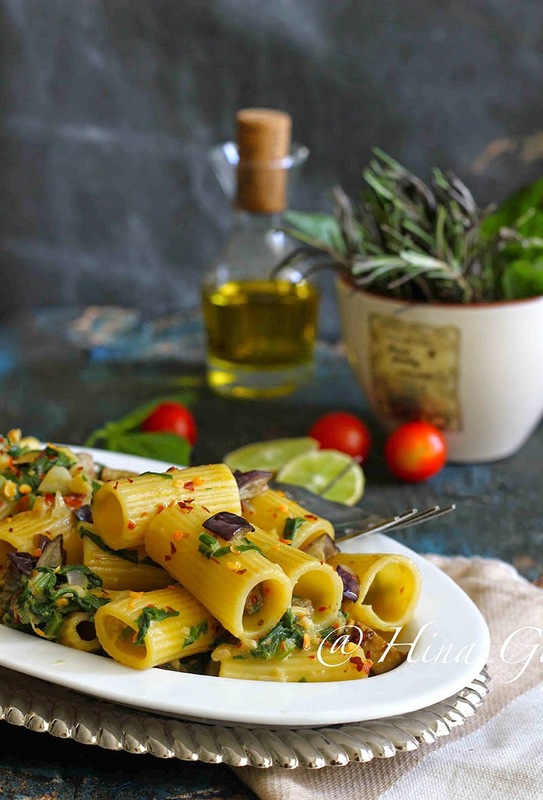 Serve Spinach and Eggplant Rigatoni warm. This is truly a one pot delicious meal. I would probably just add half and half milk and cream to reduce the fat for adults. Am sure my kids will enjoy this recipe.